The Inspiration The seeds of the Granada Native Garden were planted in 2002 when Louann Tung attended a talk by Jeff Miller of the Alameda Creek Alliance. Jeff talked about returning steelhead trout to the TriValley creek system. Louann volunteered to head the local out- reach of the Alliance, and the members in attendance decided on the name Friends of the Arroyos, whose intention was to promote the migration of steelhead trout, educate the public about watershed protection, and lead volunteer efforts for the clean-up and restora- tion of the arroyo. The following year, Louann was informed that $12,000 was available for watershed improvements, and proposals for use of the funds were requested. Starting from Scratch Louann, who lives downstream of the Arroyo Mocho, often rode her bicycle along the Arroyo Mocho trail, and was aware of a trashed-out vacant lot across the arroyo from Granada High School – actually a part of the Granada school property. Louann had a different vision of the location – a spot filled with native oaks and poppies, the only California native plants she was familiar with at the time. Until then, the area was nothing more than a place where trash and weeds accumulated. But Louann visualized a place filled with nature, with picnic tables where Granada students and other visitors could spend a peace- ful interlude enjoying lunch and relaxing. Louann’s proposal was approved! But that was just the beginning. 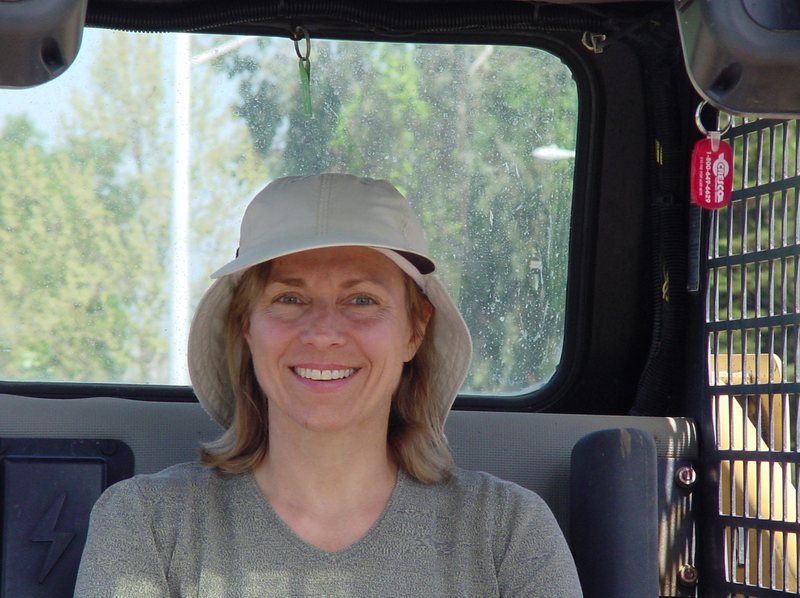 After many months of searching for a landscape designer with a knowledge of native plants that could survive with a minimum of water, Louann was finally led to Alrie Middlebrook, owner of Middlebrook Gardens in San Jose. Thus began Louann’s education about native plants, a grand design for the Granada Native Garden, and a friendship between her and Alrie! Build It and They’ll Come And they came! One thing led to another. Together with the original grant money, plus almost $800 of volunteer donations and additional donated materials from local quarries and native nurseries, as well as almost 1,100 hours of volunteer time, the Granada Native Garden gradually became a reality. 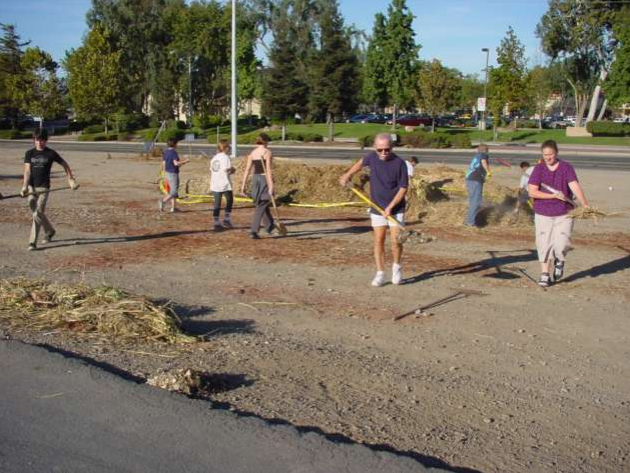 Mulch was spread over the 1/3-acre site in October, 2003. Installation of plants began in April, 2004. With the backing of the local Mormon church, Trent Egbert made the construction of the picnic tables his Eagle scout project. 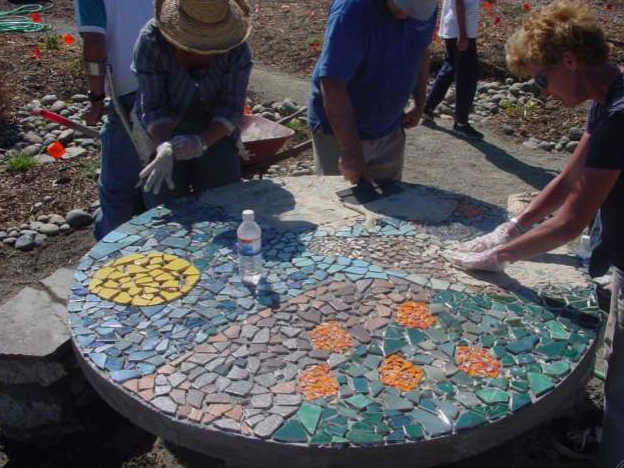 Discarded fragments of brightly colored tiles were used to create mosaics of three endangered species – burrowing owl, steelhead trout and red-legged frog – to form the table tops. Broken pieces of sidewalk concrete were used as foundations for the benches. Over the next couple of years, the new plant- ings were nurtured with water delivered by means of a hose dragged from a hydrant at the high school, across the arroyo and to the Garden. Of course, by January and February of 2005, non-native weeds were taking over the lot, complete- ly overcoming the native grasses. Eventually the weeds were largely suppressed by covering the entire Garden with cardboard and more mulch, with the assistance of more volunteers. 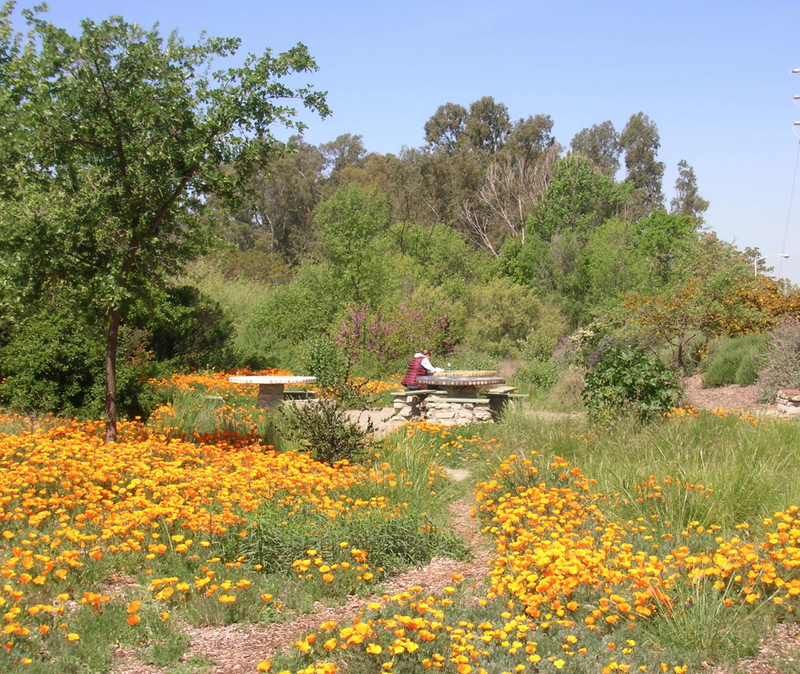 The pleas- ing ambience of the Granada Native Garden is currently maintained by the continued vigilance of weekly volunteers who help with weeding, trash pickup, and the restoration of the tables and benches. Livermore’s own Alden Lane Nursery is a major supporter of the Garden by their contributions of new and replacement plantings. Volunteers Keep the Vision Alive In the meantime, the Granada Native Garden has been a seed of inspiration for the growth of native California plants in Livermore. 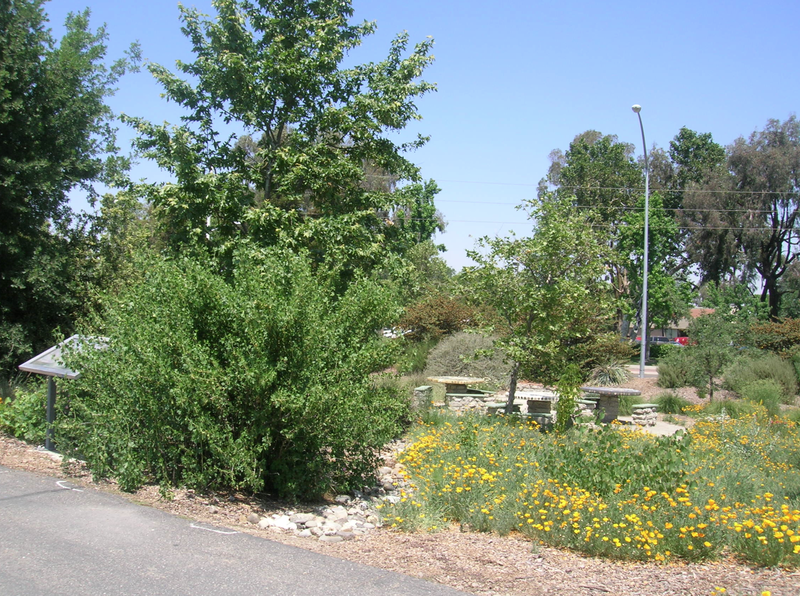 A year after the Garden was installed, Louann felt confident enough about her knowledge of native California plants to begin teaching a course at Las Positas College on landscaping with natives. Finally, in the Fall of 2011, she and Dave, her husband, fashioned a garden of 100 species of native plants in their own yard. Their garden becomes a destination for the annual “Bringing Back the Natives” tour in the Livermore area. The Garden was originally dedicated to the students of Granada High School, but easy access directly from the campus to the Garden is no longer possible. 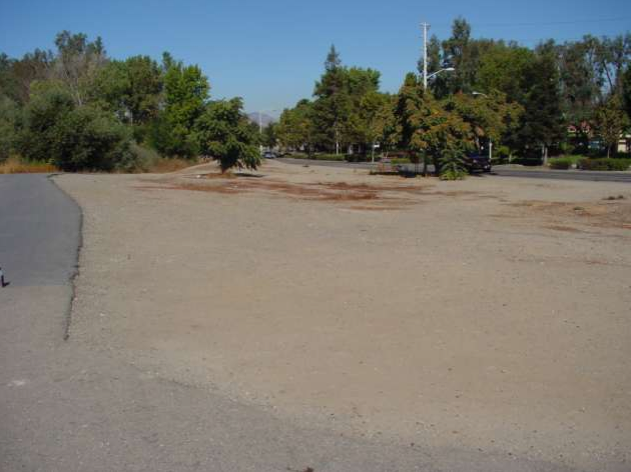 However, it is easily accessible to all members of the local communities by means of the Arroyo Mocho Trail; less easily from the parking lot in the Nob Hill shopping center. 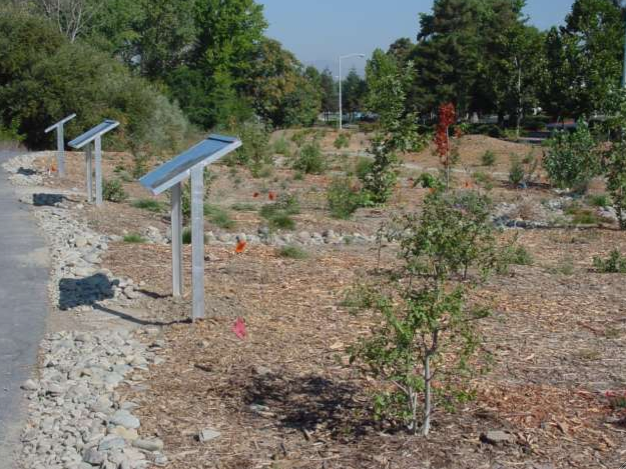 In any case, the Garden serves the community as a resource for learning about plants that are native to California and are able to survive in a climate with an increasingly limited source of water. Also, it is fascinating to learn how these very plants were vital to the everyday life of Native Americans, for food, utensils, tools, and many other uses. And, if one can block out the buzz of traffic on the adjacent artery, one can use the Garden to sit and think, read or study, or just sit and be enveloped by the gentle experi- ence of Nature – a world so much more restorative than the harsh world of concrete and asphalt that so often surrounds us. Thanks, Louann! Happy Mother’s Day!